LOVE Park sold 200 pieces of granite from the original LOVE Park to fans during their Wedding Wednesday series. Ahead of Valentine's Day, fans of the old LOVE Park waited in line to get their hands on exclusive pieces of granite from the original park. 200 Pieces of granite from the old LOVE Park were sold for $51 on Wednesday to benefit LOVE Park and Skate Philly. Philadelphia Parks and Recreation Department sold the pieces despite a Wedding Wednesday no-show. LOVE statue was covered in flowers and foliage and people could write love letters at typewriters that were set up. Skaters, history lovers and devoted Philadelphians celebrated their Valentine’s Day together in a special way. 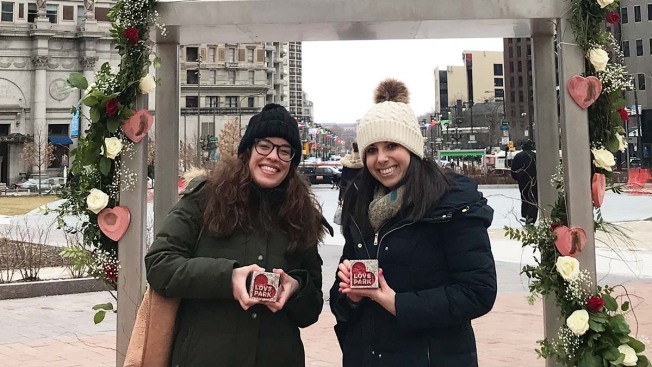 Ahead of Valentine's Day on Wedding Wednesday, fans of the old LOVE Park waited in line to get their hands on exclusive pieces of granite from the original park. Wedding Wednesdays have been putting "love" in LOVE Park since September. The special days allow couples to get married in front of the LOVE sculpture on designated Wednesdays for just $50. This Wednesday, Philadelphia's Parks and Recreation Department sold the granite keepsakes for $51 to the first 200 people waiting in line. Proceeds will go towards LOVE Park and Skate Philly. The granite pieces were carved with the park's iconic name inside a heart. People could choose from red, black or white hearts. The pieces serve as a memento of the beloved LOVE Park before it was renovated and reopened in the spring of 2018. The park had previously been a hot spot for skateboarders. The sale of the granite pieces was a way for some skaters to remember the original landmark. Melissa Sherman bought a piece of the granite for her boyfriend who used to skate at LOVE Park in the 90s and 2000s. “He just loved the park and just the other night he was talking about the granite and I knew this would be the perfect gift for him,” she said. While waiting in line, Sherman met Rachel Burgos, who was in a similar situation. Burgos had tried to purchase granite pieces previously at Christmas Village to no avail. “My boyfriend used to skate here in the 90s. He became pretty upset when it became ‘no more skateboarding,’" Burgos said. "When they had the initial run of these [granite pieces] in Christmas Village, they were sold out." Both Sherman and Burgos managed to purchase the limited granite pieces as Valentine’s Day gifts this year. “We had to get this for them. We know they’re going to be thrilled,” Sherman said. Along with the granite keepsakes, there were typewriters set up for people to write love letters or maybe even proposals.